Summary on the Sea Battle Tafl. 1732 Carl von Linné, Sweden, wrote down in his Lapland excursion diary the rules of the Saami tafl game Tablut. 1811 James Edward Smith, UK, translated the Latin parts of the Linné diary, like the Tablut rules, into English. The friendly throne square; the Linné throne square is hostile. The king being captured from 4 sides everywhere on the board (and this has in some later attempts of reconstructon lead to another error, the unarmed king, to keep up the game balance). The Linné king is armed and captured from 4 sides in the board center and 2 sides everywhere else. 1913 H. J. R. Murray, UK, identified the game described by Linné to be Hnefatafl, based on the Smith translation. King unarmed and captured from 4 sides. The king wins on the edge. And David Brown increased the board size into 11x11. Though based on some early translational errors, David Brown obviously did his home work and tested his reconstructed rules thoroughly, because our test tournament found a game balance of 12 defenders' wins per 10 attackers' wins. No throne square, i.e. no forbidden squares at all on the board. This game works and is well suited for teaching of beginners - we measured a game balance of 154 defenders' wins per 100 attackers' wins. November 2012 Aage Nielsen (Denmark) drew the dragonship pieces for online Sea Battle tafl. See the Sea Battle Tafl rules here. 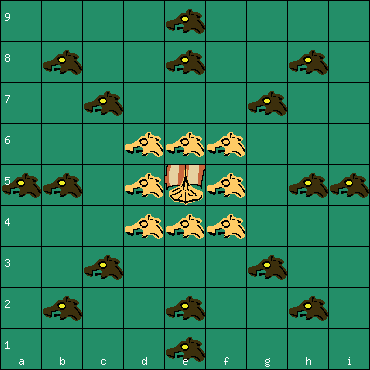 More about the Sea Battle tafl in our forum.